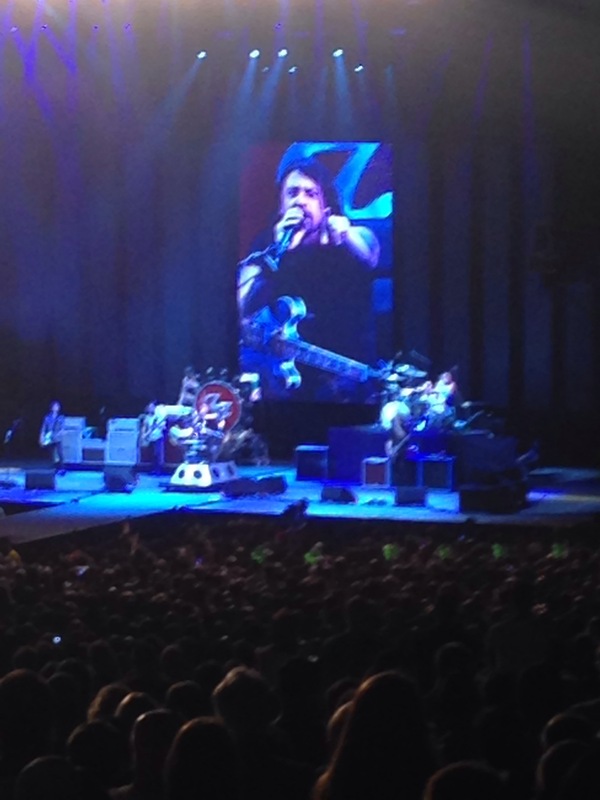 After the Foo Fighters show last night, Dave Grohl’s walking boot asked me if he could contribute a few words to my blog. I’ve never had a guest writer here, but I made an exception for it. It’s Swedish, just so you know. Not that there’s anything wrong with that. Hello, I’m Mr. David’s boot — you know, the one that’s protecting his healing bones? I’ve joined Mr. David on stage for three shows now and I’ve noticed something peculiar: Mr. David has a major time fixation. In fact, he seems to want to disregard it, although it is unavoidable. He announces at the beginning that the Foo Fighters are not one of those bands that plays for an hour and 15 minutes. Nor are they a band that plays for one and a half hours. Nor do they play for an hour and 45 minutes. I trust you can see where this is going. The crowd supports this fixation, cheering quite vigorously at each mention of a duration that they do not play. It is quite something. Ultimately it is established that they will play until they are asked to leave the stage. Which does not seem particularly cooperative. But I suppose this is part of the rock and roll ideology of which I have heard. Over and over throughout the show, Mr. David insists that it is not even close to being over. And the audience responds with great cheers. I suppose they are not concerned about the curfew as well. Tsk tsk. Nor do they seem to have anywhere else to go afterward. Do they not need their sleep? They seem in some sort of ecstatic frenzy, cheering the many songs. Sometimes Mr. David even lets that wild drummer fellow sing some songs, which I think is quite generous. He speaks of time again. It was recently the Foo Fighters’ 20th anniversary, he says. Allow me to offer my congratulations. He says he hopes to see everybody in another 20 years. This is commendable, and tells me that he quite enjoys his occupation, but I think somewhat overzealous. The logistics alone seem insurmountable. And he’ll really need to be more careful with me if he wishes to be playing rock and roll, and more significantly, walking properly, in the near future, let alone in 20 years. During one segment he played his guitar quite unmelodically for some period of time, coaxing strange sounds at high pitches. Again, the crowd seemed quite enthralled at what I believe is called a guitar solo. But I was not. He vigorously at one point rubbed the sharp metal strings of his guitar up and down my own body. This was quite uncomfortable for me. He spoke at great length of the accident back home in Sweden that led to our partnership, with much admirable self-deprecating humour. But he did disparage the great heights of our stages, which he seems to think contributes to the severity of the injury. I would politely offer that perhaps Mr. David’s recklessness on stage led to his injury. But I am beginning to learn that this would not be, as they say, “rock and roll.” The audience seems to enjoy his reckless, fun-loving nature. And I suppose I am beginning to enjoy it as well. Okay, Kevin here again. Thank you, Boot. I would like to add a few words of my own. Honestly, for someone worried about curfews, Boot sure does go on. Grohl did talk a lot about time, and I get it. It can be a real enemy. It was nice to spend three hours of my life being told, for once, that there are no time limits. We get enough of those in life. Of course, all the disregard for time led to us having to run like Usain Bolt to catch the 11:50 train. Fortunately, the conductor took pity, disregarding time himself and lingered a few minutes longer so the masses could pack themselves in. Otherwise, it would’ve been an hour-long wait and about three hours of sleep for me. “Time!” I shout, shaking my fist at the heavens. Clearly, we were back to reality. How else did they make the best of a bad situation? Among the handful of covers they played was Rush’s “Tom Sawyer.” Yell at me if you want, but I am no Rush fan. But the Foos actually made the song sound good. Towards the end of the show, Grohl let us in on a personal philosophy: “At the end of the day, it could be worse.” True, especially considering his injury. But it can also be a drastic understatement when times are good. Last night’s show, at the end of the day, couldn’t have been much better. One last thought. If I had to compare Tuesday’s U2 show with Wednesday’s Foos show, I’d say, without value judgement, U2 was an experience; Foos was a party.